This soundbar was once described as reading glasses for your ears. I couldn’t have said it better. Press the AccuVoice button on the remote and dialogue suddenly becomes clearer and more precise even at low volumes. Speech is clarified without altering music, sound effects, or general ambience. A typical British TV drama with thick Yorkshire and other heavy accents is often hard to understand. Eh? What did he say? Accuvoice gives the dialog presence and clarity. ZVOX has engineered AccuVoice using hearing aid technology. The soundbar contains a high-efficiency 24 watt Class D digital amplifier. Some of the founders of the Massachusetts-based company started their careers with Cambridge SoundWorks and other leading firms in the sound industry. The AV200 is constructed from aluminum and is solidly built. It contains three speakers that separate left and right channels surprisingly well considering the unit’s 17 inch (43CM) width. There is no subwoofer but even so, the sound is nicely balanced using ZVOX’s proprietary PhaseCue virtual surround processing. If you want to add a subwoofer, there is a 3.5mm outlet on the rear of the soundbar for this purpose. There are many third-party subwoofers available online starting as low as $75.00. If you are an apartment or condo dweller or if you watch TV late at night while others are sleeping, you should be aware that the thud of a subwoofer can be bothersome. 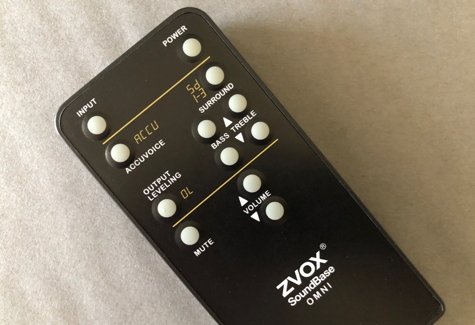 The ZVOX engineers have included an additional benefit—Output Leveling. With this feature activated via the remote, commercials and programs play at the same volume level. The guy hawking that cheap wall-to-wall carpeting doesn’t overpower the show you’re watching. This feature also helps to boost the audio levels for DVD or BluRay players that are occasionally not loud enough. Setup couldn’t be simpler: plug in the power cable and connect the audio-in cable (optical or digital) and you’re done. The instruction manual is one single page. High friction feet keep the unit secure when placed on a table or entertainment center shelf. 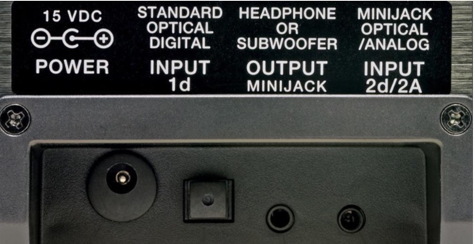 There are also hanger slots on the back of the soundbar that permit wall-mounting. Current TVs are ultra-thin. Squeezing in decent speakers can be a wrenching compromise between sound quality and slimness. As a result, a good soundbar is almost a necessity when purchasing a new TV. The ZVOX model AV200 is impressive for its sound quality and for its radical improvement of dialogue clarity. MyMac Reviews rating is 9 out of 10 for vastly improved speech presence and ease of use. ZVOX confidently offers a thirty-day trial.